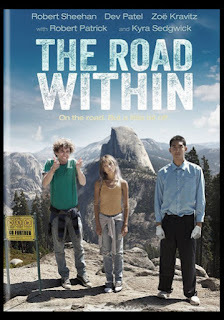 THE ROAD WTHIN has won numerous awards while playing the film festival circuit, including Best Actor for Dev Patel and Best Actress for Zoë Kravitz from the 2014 Napa Valley Film Festival and Gren Wells was named one of the Directors to Watch at the 2014 Palm Springs International Film Festival. Vincent (Robert Sheehan), a young man with Tourette’s syndrome, just lost his mom. As his symptoms get worse, his dad (Robert Patrick), a frustrated politician, sends him to a behavioral clinic run by an unconventional doctor (Kyra Sedgwick). But Vincent made his mom a promise, and with the help of a rebellious anorexic (Zoe Kravitz) and his withdrawn OCD roommate (Dev Patel), the three embark on a life-changing race to the sea that includes car theft, shoplifting, fights, self-discovery, and maybe finding a new way to live. One person's road is another person's journey and it's all about that journey!